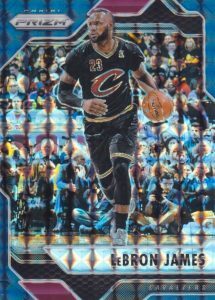 In an effort to appease collectors who purchased, or will purchase, 2015-16 Replay Basketball boxes, 2016-17 Panini Mosaic Prizm Basketball is an exclusive set provided to collectors for free. The Prizm release has also seen strong interest on the secondary market for both boxes and singles. The 100-card base set is an offshoot of the 16-17 Prizm product, but with different card numbering and new photography for stars and rookies. 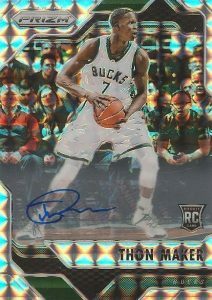 Also, the "mosaic" effect used on each card is very distinct so collectors should have no trouble telling them apart from the standard Prizm cards. Forming the bulk of the release, 100 cards make up the full base set. Base parallels include Red, Blue, Camo (#/25), Gold (#/10) and Black (1/1). Averaging 1:3 boxes, the Autograph insert consists of 27 players including Brandon Ingram, Karl-Anthony Towns, Kevin Durant, and Stephen Curry. While the base autographs are not numbered, limited parallels include Gold (#/10) and Black (1/1). Collectors should contact their distributor or hobby shop directly in order to obtain the packs. 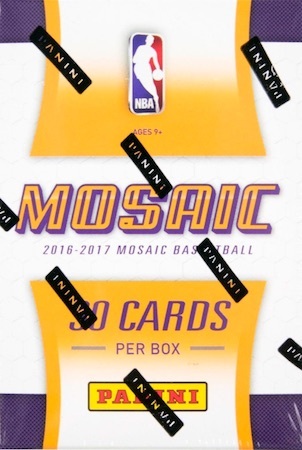 It was not expressly stated how many 2016-17 Panini Mosaic Prizm Basketball packs or boxes each collector would receive. PARALLEL CARDS: Red, Blue, Camo #/25, Gold #/10, Black 1/1.